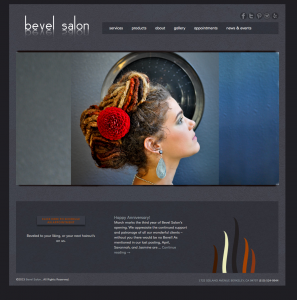 I am very pleased to share the recent launch of Bevel Salon’s new redesigned/reworked website! The original, which we did some years ago, established a strong brand and a great look. With this revamp, we took that look and expanded upon it, and introduced a lot of new features. Built in WordPress, Bevel can now easily communicate with their audience as well as feature new styles that happen each day. They are excited, I’m excited, it’s all exciting. As always, April was a joy to work with, and I wish them many years of success. Oh yes, and new print materials are in the pipeline. I’ll post those very soon!